GroEL, an ATP-fueled protein machine with a double-ring structure, assists proper folding of many proteins, in cooperation with its co-chaperonin, GroES. 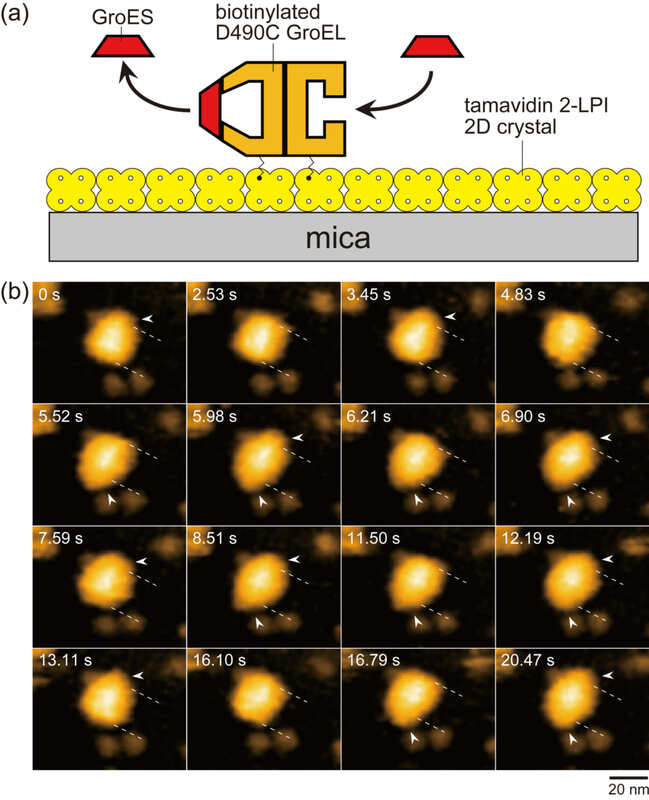 The team of Prof. Toshio Ando and Dr. Daisuke Noshiro in NanoLSI directly observed dynamic interactions between GroEL and GroES during the chaperonin reaction, using high-speed atomic force microscopy (HS-AFM). They succeeded for the first time in elucidating the entire reaction scheme of this complicated system and specifying inter-ring allosteric communications that grant high efficiency to the chaperonin reaction. GroEL is a cylindrical protein complex formed by two heptameric rings stacked back to back, each consisting of identical ATPase subunits. GroES is a single homo-heptameric ring and binds to the ends of the GroEL cylinder depending on the nucleotide state of GroEL. Each ring of GroEL has a cavity, in which denatured protein substrate can be encapsulated and eventually renatured. GroES functions as a lid of the cavity. Since this chaperonin system contains multiple components, i.e., 14 ATPase sites, two rings of GroEL, protein substrate, and co-chaperonin GroES, it has been difficult to decipher how the chaperonin reaction proceeds. In particular, the most interesting issue of how two rings communicate with each other to achieve high efficiency for the reaction has long been elusive. (see images at 5.52 s, 5.98 s and 6.21 s in Fig. 1b). Here, we describe mostly for the main pathway. In this pathway, alternate binding and release of GroES occur between the two rings. Hence the two rings must mutually sense the counter ring’s nucleotide states or GroES-bound/GroES-unboud states. That is, there must be inter-ring allosteric communications. (3) 1/k1 + 1/k2 = 1/kFB. The first coincidence is trivial, since both k4 and kFB represent the same rate, i.e., the rate of GroES dissociation from the same ring (the top ring in Fig.2). Unlike this, k3 represents a rate of state transition occurring in the top ring, whereas kBF represents the rate of GroES binding to the opposite ring. Therefore, the second coincidence indicates the existence of inter-ring communications that lead to synchrony between transitions occurring at the two rings. So does the third coincidence. Since the second (older) cis-ring in the final football transits into the ADP-bound trans-ring in the final bullet (see Fig. 2), the second cis-ring must contain ADP−Pi. Therefore, k3 represents the rate of ATP hydrolysis (ATP → ADP-Pi) on the top ring (Fig. 2). kBF represents the rate of ADP dissociation from the trans-ring (the bottom ring of the second bullet in Fig. 2). Hence, the coincidence k3 = kBF indicates that ATP hydrolysis to ADP−Pi triggers ADP release from the opposite ring, and vice versa. This inter-ring regulation is functionally important. Without this regulation, ADP dissociates quickly immediately after the formation of bullet, which is immediately followed by ATP binding and then GroES binding. As such, the encapsulated substrate protein would lose a chance to be released from the trans-ring. We can interpret the second coincidence to mean that ATP hydrolysis to ADP−Pi in the cis-ring acts as a timer to determine the time when ADP is released from the opposite ring. It is difficult to interpret the third coincidence, because we do not yet know the state of F*. However, it is sure that a certain change occurring after ATP binding (possibly a structural change enabling the substrate protein encapsulation into the cavity) is coupled with Pi release from the opposite ring. Thus, it was elucidated that the two events, ATP hydrolysis to ADP−Pi and Pi release, act as timers, according to which events in the corresponding opposite rings proceed. Finally, the entire reaction scheme of the chaperonin reaction is shown in Fig. 3. This scheme was deciphered from HS-AFM observations in the presence of denatured maltose-binding protein (MBP). Minor pathways are also included in this scheme, in addition to the main and side pathways. The chaperonin reaction proceeds in a more complex and stochastic way than ever thought before. Such a complicated reaction scheme cannot be revealed with conventional approaches. The direct HS-AFM observation of dynamic events occurring at individual molecules and individual rings of GroEL made possible this detailed assessment of the highly complicated reaction. This study also presented an important issue to be tackled in the future: i.e., a mechanism by which the reaction branches into the side pathway. The side pathway occurs at a relatively high probability (1/3−1/4), and hence, a certain mechanism of the pathway branching must exist. Figure 1. Assay system for HS-AFM imaging of dynamic GroEL–GroES interaction and captured images. (a) Schematic of assay system used for HS-AFM imaging. Tamavidin 2-LPI was two-dimensionally crystallized directly on a bare mica surface. GroEL D490C biotinylated at Cys490 located at its equatorial domain was tethered to the tamavidin 2-LPI 2D crystal surface through the biotin–tamavidin 2-LPI linkage with a linker length of approximately 2.5 nm. Because this crystal surface is resistant to non-specific protein binding, the tethered GroEL does not adsorb onto the surface. (b) HS-AFM images showing repeated GroES association and dissociation at the two rings of GroEL in the presence of denatured MBP. The images are clipped from successive images captured at 4.35 frames/s. The dashed lines indicate the positions of toroid ends of the GroEL molecule. The arrowheads indicate GroES bound to GroEL. Besides football and bullet complexes, GroES–unbound GroEL also appeared at 2.53, 4.83 and 16.10 s. The bulk solution contains 1 μM GroES, 2 mM ATP and 200 nM denatured MBP. Figure 2. Allosteric communications between two rings of GroEL. The football complex (F*) shown in pale colours are apparently the same as but kinetically different from the football complex formed immediately before. The residence time distribution of bound GroES was best fitted to a sequential four step reaction model with four rate constants, k1, k2, k3 and k4. These rate constants correspond to state transitions occurring at the top ring. The rate constants, kFB and kBF, shown in blue correspond to the F-to-B and B-to-F transitions occurring at the bottom ring. The transition steps that occur synchronously between the two rings are shown with the bars marked with (i) and (ii). Figure 3. Kinetic reaction scheme of GroEL–GroES interaction revealed by HS-AFM imaging in the presence of MBP. The thickness of arrows (shown with solid black, red, and green lines) along reaction pathways indicates the relative frequency of occurrence. The dashed red arrows indicate reaction processes occurring in the ring bound to GroES shown in red, while the dashed blue arrow indicates reaction processes occurring in the ring bound to GroES shown in blue. The order of k1FB-II and k2FB-II and the order of k1 and k2 are tentative. In the side pathway, the coexistence of ATP and ADP in one ring is shown but hypothetical. This hypothesis can possibly account for the mechanism of pathway branching into the side pathway, although it has to be proven in the future.